The Centre for Quality Improvement and Patient Safety (C-QuIPS) is a joint partnership between the University of Toronto’s Faculty of Medicine and two of its major teaching hospitals, Sunnybrook Health Sciences Centre and the Hospital for Sick Children. C-QuIPS provides leadership in quality improvement and patient safety education complemented by research programs and collaborative networks within the Toronto Academic Health Science Network (TAHSN) and the broader healthcare system. Recognizing that the science of patient safety and quality improvement involves not just traditional biomedical sciences and health services research but also other disciplines, including human factors engineering, cognitive psychology, complexity science and information technology, the educational and research activities of the Centre draws on individuals and institutions in diverse disciplines and professions. C-QuIPS began as the University of Toronto Centre for Patient Safety (in January 2009), reflecting the early focus on patient safety as a particularly galvanizing aspect of healthcare quality. Having a clear focus, especially early on, served a useful purpose. However, many of our activities, especially in education and capacity building related to aspects of healthcare quality broader than patient safety problems. In 2013, with the approval of the Faculty of Medicine and the sponsoring hospitals, we made explicit the Centre’s engagement in quality improvement more broadly by officially changing its name to C-QuIPS. Core and affiliated members engage in a broad range of research, mostly in the acute care setting, but also focused on improved care coordination and transitions across settings of care. Specific research topics include clinical informatics, medication safety, usability and human factors engineering, fatigue, handoffs between providers, innovative models for teaching the concepts and methods of quality improvement, and improving methods for identifying patient safety problems. For a list of publications by core or affiliate members of C-QuIPS go to our Centre Publications. Large studies from multiple institutions grab headlines and have the best chance of traditional academic credit (grants, publications in high impact journals). On the frontlines of healthcare, however, individual clinics, wards, and even whole hospitals seek to develop solutions to patient safety problems, improve efficiency, make care more patient-centered, or institute other improvements. These efforts benefit from the input of researchers with expertise in quality improvement, but are seldom led by such experts. In order to increase the capacity of institutions to develop, successfully execute, and evaluate local improvements in care, we have engaged in a number of education and training efforts. These range from 1-2 day workshops intended to provide a basic grounding in practical methods for tackling healthcare quality problems, to a longitudinal certificate program (over 170 healthcare professionals and managers have taken this 9-month course over the past 4 years), and the Master’s program in Quality Improvement and Patient Safety runs in partnership with the University of Toronto’s Institute for Health Policy, Management, and Evaluation. These educational efforts all share the underlying goal of instilling frontline providers and middle managers with the tools required to undertake successful improvement projects in their practice settings. No matter how much the science of patient safety or quality improvement may advance in the pages of research journals, the results of these studies require tailoring to local contexts in order replicate promising solutions successfully. And, institutions often have local problems not addressed by major research. In either case—implementing the results of published research or addressing practical, local problems—institutions need to have the capacity to undertake these activities successfully. Our education and training programs seek to develop a cadre of clinicians from different professions and practice settings who can lead or meaningfully support such local improvement activities. Support local improvements directly by providing expertise to healthcare institutions interested in addressing specific problems or evaluate new quality improvement initiatives. For instance, we have assisted hospitals in evaluating their Patient Safety Walkrounds and Critical Incident Reporting Systems programs in order to identify aspects in need of improvement. We have also assisted hospitals interested in investigating their rankings on publicly reported quality metrics, such as hospital standardized mortality ratios (HSMRs). Foster connectivity between groups working in patient safety and quality improvement. These fields span different healthcare professions (medicine, nursing, pharmacy, allied health), traditional clinical research but also sociology, psychology, and engineering, to name just a few. The heterogeneity of these fields, compounded by the academic tendency to work in professional or disciplinary silos, can make for a very fragmented landscape. And, even outside research, hospitals and clinicians in the same city can be working on the same problem in isolation. Through both formal and informal means, C-QuIPS seeks to foster connections between groups working in patient safety and quality improvement, so that groups working on the same problems can learn from each other and also so that groups using different techniques and methods can benefit from collaboration. C-QuIPS is an Extra-Departmental Unit (EDU) within the University of Toronto. Specifically, it is an EDU: C, as we do not appoint faculty, nor do we have student admitted directly to us or grant degrees (http://vpacademic.utoronto.ca/academic-units/extra-departmental-units/). 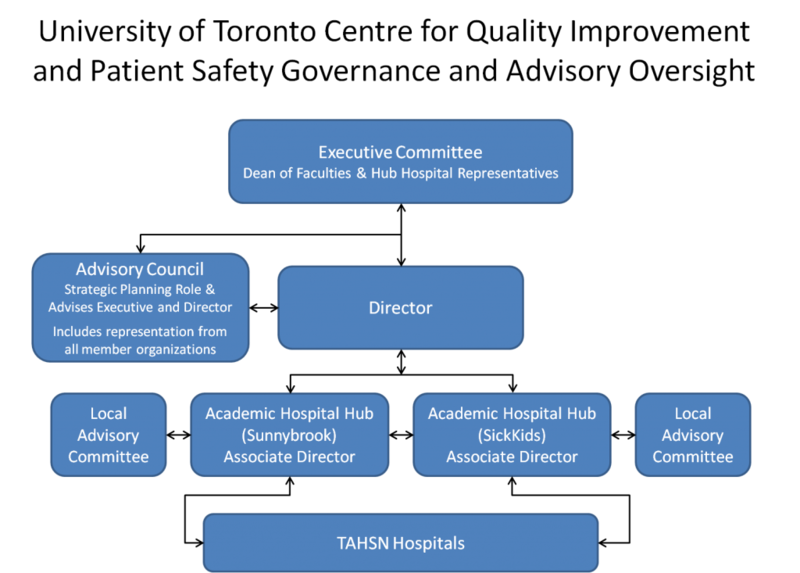 Consistent with the model for other multi-departmental academic units at the University of Toronto, the Governance of the Centre for Patient Safety consists of an Executive Committee and an Advisory Council. C-QuIPS recently underwent its second 5-year external review. The report, was prepared by Dr. Jennifer Myers (University of Pennsylvania) and Dr. Lisa Calder (University of Ottawa and Director of Research at the Canadian Medical Protective Association, the national medical liability insurer for Canadian physicians). Over the past 10 years, C-QuIPS has demonstrated phenomenal productivity in terms of the number and diversity of QI trained health professionals from multiple disciplines and scholarly output. The centre has moved beyond the proof of concept phase since its value has been clearly established in terms of contributing to continuing professional development in quality and safety along the continuum of health professions education. The Centre developed two reports: an inaugural report in January 2010, and a three-year progress report in 2011. Near the end of its fifth year, the Centre underwent an external review as part of the standards of practice of a UofT Faculty of Medicine EDU. The external reviewers were Professor Charles Vincent, Director of the Imperial Centre for Patient Safety and Service Quality (CPSSQ) and the Clinical Safety Research Unit at Imperial College London, and Dr. Ward Flemons, Quality and Safety Education Lead at the Ward of the 21st Century, a research and innovation initiative based in the University of Calgary (UCalgary) and the Calgary Zone of Alberta Health Services (AHS). The Centre for Quality Improvement and Patient Safety (C-QuIPS) offers a range of consulting services, from free hour-long type consultation to UofT faculty members and TAHSN staff to external consulting. IHPME, in collaboration with C-QuIPS, offers a new MSc concentration in Quality Improvement and Patient Safety. It is English Canada’s only in-person graduate program to offer a specific focus on quality improvement and patient safety and offered in a modular format to allow individuals to earn this research degree in one year without interrupting their careers. This concentration in Quality Improvement and Patient Safety provides MSc students with the opportunity to focus their research and learning on all aspects of improvement science, current issues in healthcare quality and safety and relevant leadership and influencing skills. C-QuIPS offers the Certificate in Patient Safety and Quality Improvement which runs September to June. Applications will be available in March 2018 for the 2018-2019 year. If you are interested in the Certificate Course, please contact Lisha Lo at lisha.lo@sickkids.ca or 416-813-7654 ext. 228513. The Centre offers Quality Improvement Workshops, which consist of 8 hours of didactic lectures and group activities to introduce your organization to the basics of quality improvement. If you are interested in the QI Workshop, please contact Lisha Lo at lisha.lo@sickkids.ca or 416-813-7654 ext. 228513.